Bill Harlow Retires after 36 Years of Service from Strongwell! Bill Harlow (Molded Grating Supervisor-Bristol) was recently recognized in honor of his retirement from Strongwell after 36 years of service. Bill began his career with Strongwell as a Resin Mixer and was later promoted to supervisorial positions within the pultrusion, fabrication and cooling tower departments. One of the things he will miss most about Strongwell is his team of coworkers. He plans to spend his newly acquired free time doing multiple home renovations. 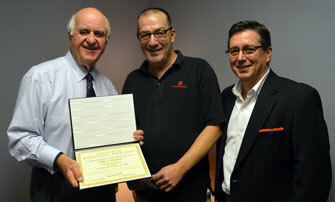 Strongwell congratulates and thanks Bill for his hard work and dedication over the years.